Construction Claims Advisor (a $329 value)! The intended purpose of construction scheduling is to assist with proper planning and coordination of a project. Unfortunately, construction schedules are often used to help build claims against project owners. Much of the process of building claims through the use of schedules involves schedule gamesmanship. This exclusive three-part program identifies more than 15 scheduling games and offers more than 45 suggested defenses to help prevent schedule gamesmanship. The webinar series was well thought out and delivered. The 'real life' experiences shared by the speakers added true value to the webinar. I think this was very good and just about the right time length for each session. Some suggested defenses involve changes to contract document language and thus need to be implemented during the design phase. Other suggested defenses are pragmatic in nature and can be implemented on a daily basis by a knowledgeable construction management team even in the absence of specification language. Based on a number of papers and presentations by construction claims expert Jim Zack in the 1980s and 1990s, Jim, in his role as Executive Director of the Navigant Construction Forum (the global construction industry's resource for thought leadership and best practices in dispute avoidance and resolution), takes a fresh look at how the games have changed since then. For both owners and contractors, a careful drafting and reading of the schedule specifications is imperative. Contractors can lose their rights; owners can lose their shirts. The intent of schedule specifications is to measure progress on the job but also to mitigate future delays and resolve past disputes. Learn what some industry-recognized specifications have done to combat abuse and why further changes may still be necessary. 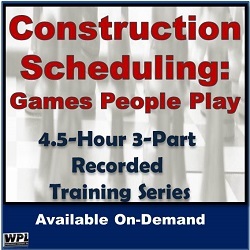 The Construction Schedule Games paper will be provided to all attendees to serve as a checklist for identifying and addressing schedule games. This thorough treatment of the subject could not be taught in just one single webinar, so it is being presented in a special three-part series. In addition, listen in on the 15-minute question-and-answer period so you can hear specific issues discussed by the original live audience and gain additional knowledge about the topics. This recorded series is a must if you're a contractor, public or private owner, subcontractor, construction manager, owner's representative, architect, or other design professional providing project oversight services. Certificates of completion are available upon request for use in obtaining professional education credits. Emily, an Associate Director for Ankura, has a B.S. in Industrial Engineering and is a Certified Planning and Scheduling Professional (PSP). Experienced in proactive schedule reviews, delay, acceleration, lost productivity & damage analysis, she has worked for owners, contractors, insurance companies & legal counsel. Projects include buildings, highways & bridges, power plants, waste water treatment plants & spent nuclear fuel facilities. Stephen is a Managing Director in Ankura’s Global Construction Practice. He is a registered professional engineer with 22 years of diverse construction and engineering experience serving both the public and private sectors in the areas of construction management, engineering design, estimating, contract administration and construction inspection. Mr. Pitaniello’s experience also includes the preparation and analysis of various complex delay, acceleration, errors & omissions and loss of productivity claims. He is retained by owners, design professionals, contractors, subcontractors and their counsel and regularly provides services to include project advisory services during construction, schedule delay analyses, damage analyses, productivity analyses, disputed extra work reviews, errors & omission analyses, technical issue analysis, litigation support and expert testimony on a variety of complex construction projects. James is a Senior Advisor for the Ankura Construction Forum. The Forum strives to be the construction industry’s resource for thought leadership and best practices on avoidance and resolution of construction project disputes globally. Formerly he was the Executive Director of Corporate Claims Management for Fluor Corporation, one of the world’s largest publicly owned engineering, procurement, construction and maintenance (EPCM) contractors working in the areas of energy, chemicals, infrastructure, manufacturing, life sciences and mining. Mr. Zack was previously Vice President of PinnacleOne and the Executive Director of the PinnacleOne Institute and a Senior Construction Claims Consultant for CH2M HILL, Inc. Mr. Zack has, for nearly 40 years, worked on both private and public projects. In the construction claims field, he is a recognized and published expert in mitigation, analysis and resolution or defense of construction claims and disputes.